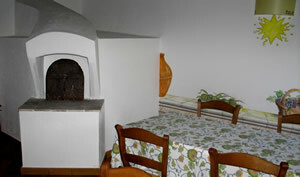 Next to the local mill there is the great oven room with an unusual shape that evokes enchanting images of ancient country life and ancient fragrance of freshly baked bread, stuffed buns, roasted vegetables. 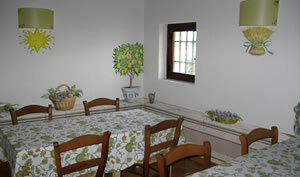 The kitchen of the farmhouse is still there offering the taste and authentic flavors of Sicilian cooking from early breakfast with homemade jams and homemade cakes served in the rooms or in the garden under the millstone in the olive grove. The scents of Sicilian cooking from the kitchen continue on to dinner, where the taste of the vegetables and olives are presented in a thousand variations starting with the starters until the main courses offering the subtle bittersweets learned from the Arabs. And finally the desserts with almonds, lemon, sesame ... accompanied by a muscat or a raisin.